I'm retired from the Auto business. Surf fishing, fly fishing, hunting, shooting, metal detecting. But now mostly fishing. Retired. But I work with Autistic children at Local school. They can't no matter how hard they try. That's why there weak snowflake's and un American. There the product of the same slobs we had in the 60's. To man up you have to be a man first. All In The Family reboot...can they do 'it' today? Even if we didn't live in a PC world, They couldn't do it right. Most if not all remakes of the old movies stink because the actors are pretty much all gone.Imagine trying to remake On The Waterfront, Gone with the wind. The quality of the actors isn't there anymore. Same for the classic T.V. shows. After catching a dozen or so, Get some Blue ointment from the drugstore. Is that a photo of the Gentile Giant?. Another POS put where it belongs. Wire is right about the Battalion. I bought a 12' conventional for sharks and big drum, It really is a better rod . I love the Battalion rod. There not that much more money than the equal Prevail. I only bought the prevail today because Wally world had it for $64.99. Mistake or not I jumped on it. Tony, Are you casting from the beach or jetties. Jetties I use a 9' star rod, surf I use a 11' Tsunami Elite. Jetties I don't like a longer than 9' rod. surf I like a 10' or 11' for the extra distance. On the 9' star I use a Penn BTLii 6000 with 20# mono. I personally do not like braid. Now on the 11' Tsunami I use a Penn BTLii 5000 with 15# or 17# mono. I just bought a Prevail 11' 2 to 6 oz for soaking bait. I only got it because it was a good price.Looks like a nice rod. Tight lines. Thanks Sudsy, I'm partial to the 704 myself. I'll just be soaking bait with it. I wont be casting plugs with it. But I haven't used the 850 for years. I have other rods and reels for casting plugs. The 740 is 3 oz lighter than the 850. I just picked up a Penn Prevail 11' 2 to 6 oz rod for a good deal. 11 ft rod it will replace ,I used a newer Penn 704z reel. I have a like new SS850 reel also . In size is the 704z the same as the 850. What's going to be the better size reel for the 11 ' Prevail. Very nice job. She will love it. For Summer surf fishing on a nice hot day, I wear a bathing suit, T shirt and that's it. If the water is that cold and I don't want to get wet, I wear Waders, Stomur surf jacket. I put the waders away when the water gets to 60 degrees or more. Summer I wouldn't worry about getting a little wet. early Spring, Fall and winter I do. I went with a Star Stellar light 9' 1 to 4 0z. Rods reforms great. Rod is cast great, feels great. Last week lifted4 shorts with no problem. I like it better than my St Croix's. Ok, Good info.Will do next time. Just got back from fishing a Delaware inlet jetty. 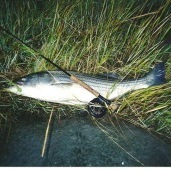 Saturday , I caught about 4 small Stripers on Bucks. Other guys caught more. It was pretty steady for awhile. But man it was wet out there. Thank God for Korkers, Water proof pants and My Stormr top. Man it felt great. Hi, Just got back from fishing a De inlet at the beach, Small Stripers, No blues. Heard a report some were caught near the Md Line , but could be rumors. KnewBee. Years ago I was shown a passage in the Koran by a muslim grunt I was in bootcamp with. It said the world will be Muslim. Non believers will be given a choice to submit to the Muslim faith or be done away with or become slaves. Do you dispute this that there taught this in the Mosks . Do you think there is an underlying motive for there hate of the western world. Do you dispute a lot of Mosks are breeding grounds for fighters. How many of us so called bigots have set bombs off in there countrys. Come home to America. Omar is a little POS, that don't represent all American Muslims, But she is wrong. Because My people that came here in the 1900's were hated by the Irish, Should I give credit to the Mafia for there crimes. Look for another Muslim hero.